Hello y’all!! Its 647am now..hehe and im not in bed yet. That’s because i’ve made friends with someone name TB – short for Textbook. Oo, we had a rough start so i decided to stay up so that i can know him better….NOT!!!!! *take guns out and shoots at it* Bloody hell…still mixing up alot of terms. D.I.E. oh, and also thanks to my lovely kokocrunch, for introducing to me the best thing in world at the wrong-est time!! I hate you so!!!! I’ll be posting this long overdue post because i canot resist not posting up the beautiful photographs that DivaLisa had got back from the person she hired. Lets go back to the break of dawn on 1st of January this year. 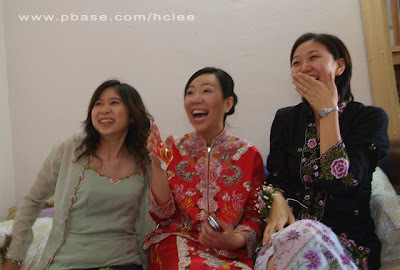 She woke up very early that morning at the call of her bridesmaid for hair and makeup at the bridal house. I dreamily woke up about an hour after that to get myself ready as well. 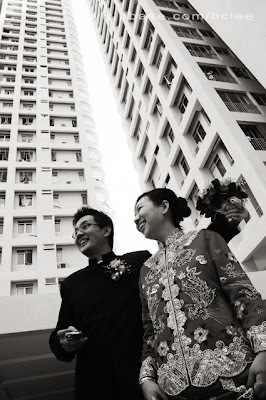 The cheemui’s has been planning and scheming all week long on how to “touture” the heng tai, headed by non other than the bride herself -.-|| Well, i would say that most of the idea was given by me.HEHE I guess im the psychotic one. Getting the torture kit ready was fun!! Thinking of the idea alone makes us giggling all the time. The sound of car honking nonstop feels weird to me. 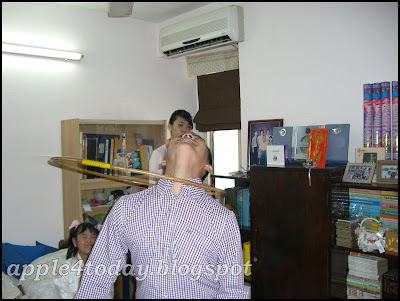 As it’s always a sign of other household having “hei xi”. It does not hit me that it’s finally my family turn until the people start shouting that the groom is here. The groom and his hengtais arrive on time. and the tradition of breaking the walls of defence begins. My house, the house i’ve been in for more than 10years had never experience such noise and crowd before. 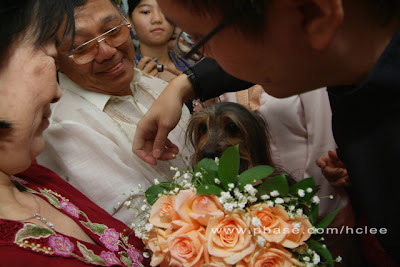 Of course, we would not let them get to the bride so easily..HHAHAHA. The head of chimui, Irene, giving out instructions on what to do. 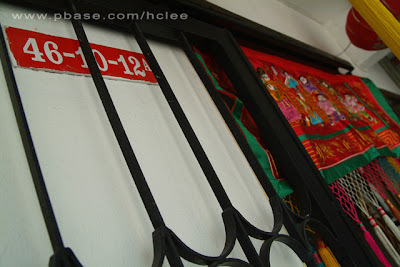 And the hengtais obeyed, with much objection especially the waxing part. Unfortunately i do not have any photos of it. My sd card died that day remember? 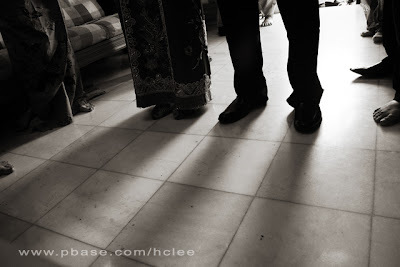 The “mui poh” just had to potong stim as she say the auspicious time is near, have to get the bride, so we couldn’t go on with our game, but that’s when almost is done. The final obstacle is that, they had to find my dog, Jaz. Because the key to the room is tied around her neck. It’s so funny seeing those huge guys looking and coeing at my dog. The day was followed by the usual Tea ceremony. Go by ranking, my grandmother first, and then parents, then uncle and aunties. Receiving blessings from the elderly. 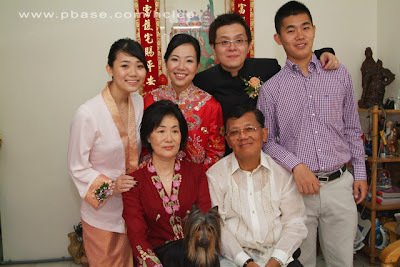 Along the process, the “mui poh” would ask them to do several things. Like entwine together and then she’ll rap on the good things. Together, they shall be for the future they will face. Together, with every steps they shall take. Money bag taped to the palms of the bride, in hope that she will bring wealth and fortune to the family they will build. Like the japanese fortune cat. Before going over to the grooms place, we took alot of photos. 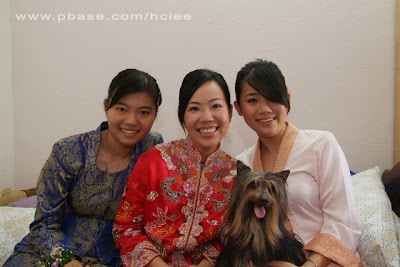 First, me, sis and cousin, ting ting with Jaz. I dono why my fringe fall like that. >_< Friends that came to witness this joyous day. Friends that has been together then, that will be together in the future too. Being able to laugh together with those precious to you are one of the miracles in life. A family potrait. 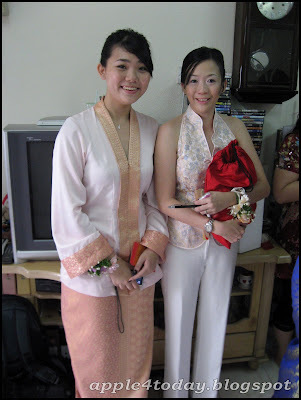 And then one last one withe the chimui’s in kebaya. A request by the bride. Which had almost everyone rushing to the tailor. There she go, over to the grooms place. With all the kids running around the place, we are lucky to have an inhouse entertainer. None other than my very own brother. Hereby, the last photo of part 1. Stay tune for the dinner!!! 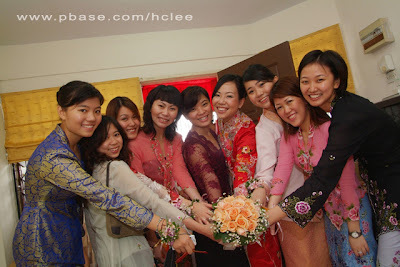 the kebaya gang looks cool! it’s obvious. Or you edit some serious editing ? ?